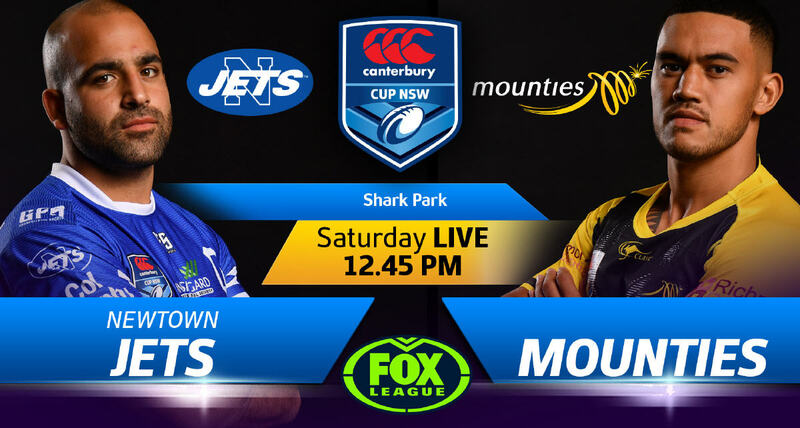 The Newtown Jets will be looking for a win in Round Two of the Canterbury Cup NSW competition to get their season off the ground. Mounties, the Canberra Raiders partnership club, will provide stiff opposition and they are coming off a 28-all draw with St George-Illawarra last weekend. Halfback Kyle Flanagan, winner of Newtown’s best back award in 2018 and also last season’s top points-scorer, has been named to play for the Jets in tomorrow’s match. Please note that this match is being televised live on Fox Sports. This match is being televised live on Fox Sports. Touch Judges: Cameron Paddy and Mark Bohan. Will Kennedy, Rusiate Lumelume, Bronson Xerri, Jackson Ferris, Matt Evans, Jack A. Williams, Kyle Flanagan, Jaimin Jolliffe, Luke Polselli, Braden Hamlin-Uele, Anthony Moraitis, Siosifa Talakai, Greg Eastwood. Bench: Billy Magoulias, Joshua Carr, Daniel Vasquez, Wes Lolo. Brad Abbey, Tony Satini, Reubenn Rennie, Sebastian Kris, Andre Niko, Ata Hingano, Brendan O’Hagan, Emre Guler, Tom Staling, Royce Hunt, Reuben Porter, Hudson Young, Steven Tavita. Bench: Mitch Kennedy, Dean Matterson, Jarrett Boland, Daniel Keir, Anthony Layoun, Jarrod Brackenhofer.